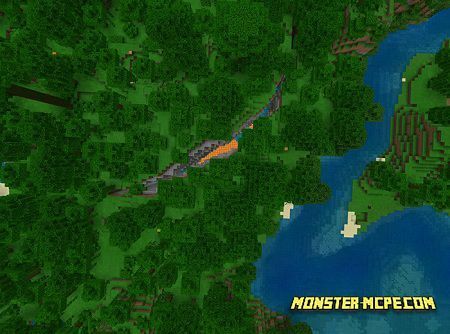 It is great opportunity to get very big experience in survive in jungles of MCPE world. Your start place is in center of jungle. From ten to twenty blocks from you, you can find a big ravine. 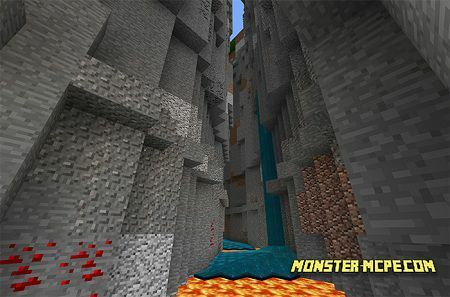 In this ravine player may find different types of ore. Use ore in order to create useful items, some tool or weapon. Such type of seed can be a very good experience in future. The ravine is located near river, that is why river will be a good reference point for player, in order to find it. It is very deep, and be careful, when you decided to jump there, player should land in water, not in lava. Also, make ladder from the wood, which player can gather. As it was mentioned before, there are a lot of different ores at the bottom of the ravine. You may find here even such ore as Redstone. 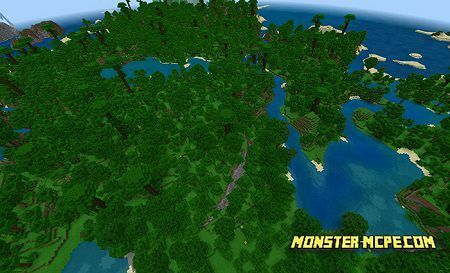 This biome is pretty big, here you may see river which is lead to ocean.